I came across a bag of these in the freezer and decided to have them for dinner. They were as good as leftovers as they were when I first made them for a buffet. Cornish hens are ideal for a buffet dinner because a quarter of a hen make a nice small serving if guests are filling their plates and don’t want to take a big portion, such as a chicken breast. They can always go back for more. These hens have a slightly warm, but not spicy taste from the ginger. The original recipe, from Cooking Light, showed them as rather pale, but mine became nicely brown. They don’t really have a sauce with them. This is the dish I made the famous Jezebel Sauce for…but they are fine without any sauce at all, which is how I had them for dinner tonight. Preheat oven to 475°. Line a jelly roll pan or large cookie sheet with foil and spray with cooking spray. Combine first 4 ingredients in a small saucepan; bring to a boil. Combine water and cornstarch in a small bowl, stirring with a whisk. Add to juice mixture in pan, stirring with a whisk. Cook 2 minutes or until thick and glossy, stirring constantly. Place hen halves, meaty sides up, on prepared pan; sprinkle hen halves with salt and ground ginger. Spoon juice mixture evenly over hen halves. Bake at 475° for 25 minutes or until a meat thermometer registers 180° when inserted in a thigh. Makes 4 servings (serving size is 2 pieces) at 4 grams of fat/serving. I took the Cornish Hens for lunch yesterday – but on a sandwich. I took the meat off half a hen, sliced it, and put it on a whole wheat bun with barbecue sauce. It was fabulous. If I wasn’t taking lunch to work, I would have put some nice chopped onion on it – but I didn’t want onion breath. I had planned to make an elaborate dish with Cornish hens – something with fruit – but the weather has turned unseemly hot for mid September, and I wasn’t in the mood. So I opted for a simple, baked preparation. 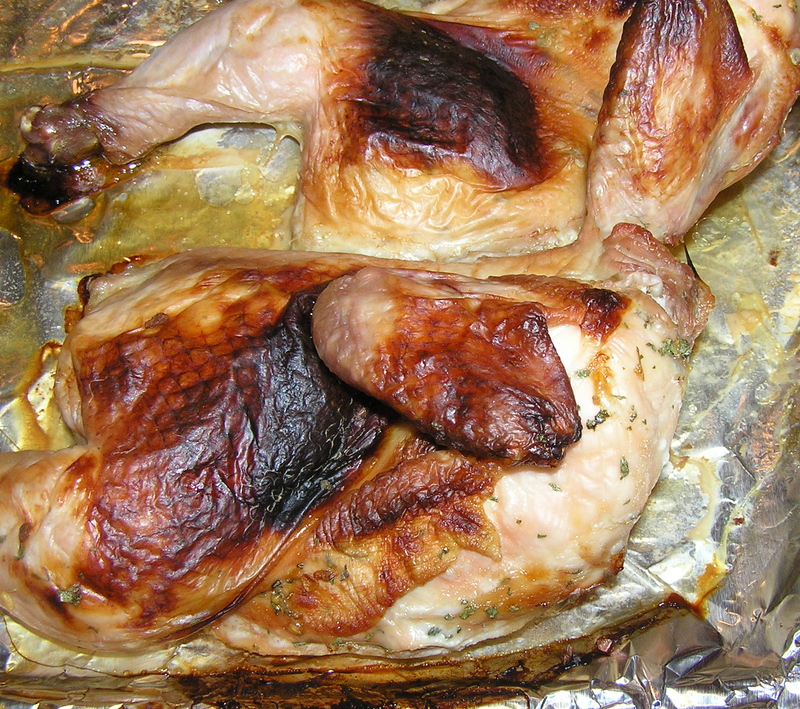 Usually, I recommend removing the skin from the hens before cooking, but baking them without skin (and not swimming in a sauce) might make them dry. The problem is that if you season poultry and bake it with the skin on, then when you remove the skin you remove all the tasty seasonings. A good way to keep the seasonings on the poultry where you can taste them is to lift the skin, and rub the herbs and spices on the chicken or hen under the skin. When you bake it, the spices flavor the meat, and the bird stays moist. Preheat oven to 350 F. Mix the honey, hot water, garlic, chervil, and sea salt in a small bowl and set aside. Note: this could easily have used 4 cloves of garlic, but I planned to take it for lunch after the first evening, and the people I work with might not appreciate fragrant food. Remove the wing tips from the hens and discard – this makes it easier to take the skin off after the hens cook. Using your fingers (I find my thumb works well), lift the skin of the birds from the the middle of the leg to the wings, being careful not to tear the skin. Carefully rub 1/4 of the honey-garlic mixture under the skin of each halved bird, covering the bird as completely as possible. Smooth the skin over the hens, place them on a baking pan, and bake for 45 minutes. Yes, the hens look lovely when they come out of the oven with their browned skins. But don’t be tempted to eat them this way. A half hen without skin has 4 grams of fat; a half hen with skin has 23 grams of fat. Take the hens out of the oven and remove the skin with tongs and/or a fork. It should come off quite easily, since you have already separated it from the bird. It’s not as photogenic as the browned hens, but it is very good. If I was serving it for company, I would garnish it with some sort of sauce, so it wouldn’t look like a naked bird. I have a smoker – a useful item when it is hot and you want to make something interesting without heating up the kitchen. It is an electric smoker, which I purchased because it seemed safer than my old charcoal smoker in this fire-prone region. You soak wood chips in water – I used apple wood this time – and then place them around the electric elements before plugging in the smoker. The beauty of a smoker is that you can get that smoke-penetrating-the-meat flavor without the added salt that most commercial smoked products have. It is also inherently a low-fat way of cooking. Any small amounts of remaining fat drip into the water pan below the racks. I have smoked fish, leg of lamb, pork tenderloin, turkey, and later this year I plan to smoke a duck. What you see on the rack below the hens are mushrooms. I like to fully use the smoker space, so I usually tuck mushrooms or other smokable vegetables like eggplant around the main course. Smoked mushrooms are good on sandwiches, and in salads and pilafs. The smoked hens develop a beautiful color. 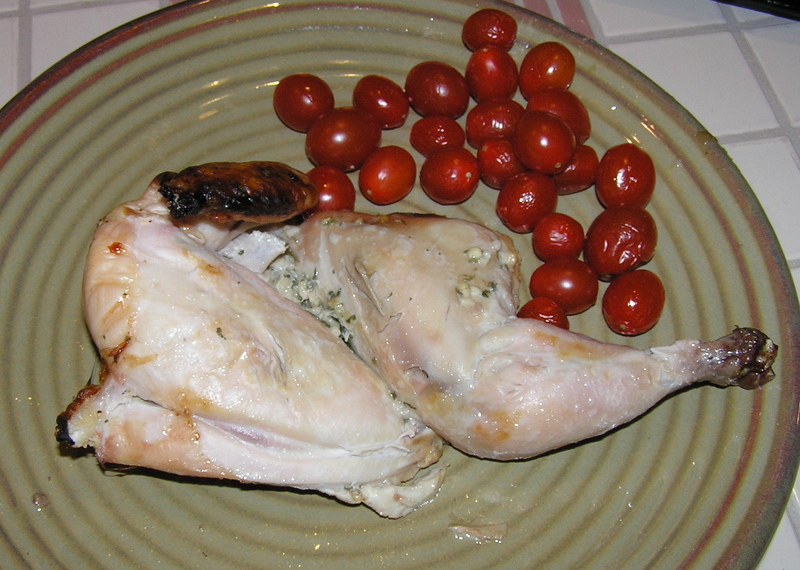 I used to think that Cornish hens were very high fat, and with skin on, they are a higher fat entrée. But without skins, a half of a hen, the usual serving size, only has 4 grams of fat. I am somewhat obsessed with blueberries. At this time of year, I buy them by the pound and try to work them into everything. The barbecue sauce originally came from Eating Well, another magazine you should consider reading. I left the jalapeno peppers out because I didn’t want a very spicy sauce, but added a little black pepper for some warmth. This makes a fairly assertive barbecue sauce. Heat oil in large saucepan over medium heat (In retrospect, I would have used a non-stick pan). Add onion and cook, stirring occasionally, until golden (about 3 minutes). Add garlic and cook for 30 seconds. Add bourbon. Increase heat to high and bring to a boil, cook until most of the liquid has evaporated. Stir in blueberries, ketchup, vinegar, brown sugar, molasses, allspice, and black pepper. Return to a boil. Reduce the heat to a simmer and cook until thickened, stirring occasionally, about 20 minutes. This makes 2 cups. They list the serving size as 1 Tablespoon, and 0 grams of fat/serving. Realistically, you’d use more than this on your entrée. I think I used about 1/4 cup. This would make it about 2 grams of fat/serving. And what is underneath the hens: a quick pilaf of brown and wild rice mix to which I added chopped up smoked mushrooms, green onions, and a handful of dried blueberries. I estimate that the whole entrée had 8 grams of fat, including 1/2 hen, a cup of pilaf, and 1/4 cup of sauce. I took the pilaf the next day for lunch with some chopped Cornish hen mixed in.